…a darkened chamber dominated by a large figure. We could see that someone had been working here recently; the entrance I had so carefully hidden had been uncovered. I made a note to return as soon as I could and fill in the hole again. The visitors were so intrigued with the entrance at the bottom of the excavation that they ignored what the figure was trying to tell them. ● The phrase at the bottom of the statue reads “FATA VIAM INVENIENT?” which is Latin for “Fate will find a way?” The statue represents a modification of the hermit card from a tarot deck. [Independent Credit: David Gentile | White Raven] This connection is reinforced by the card suit puzzle. [Credit: Vewatkin] The number of the hermit card is 9. “Fate” refers the fortune telling function of tarot reading. The answer to the question “Fate will find a way?” is obviously no, since the hermit is not holding his lantern, staff-less, and blindfolded. Thus 9 is the wrong choice. [Credit: One For Me | White Raven] Further reinforcing this, the number on tarot cards is in Roman numerals, the correct door is spelled out in Roman numerals as wooden braces holding up the hermit statue. I’ve taken the 2 words ” I AM ” from room 45 and combined it with the misprint that can be found in room 27. The word MISPRINT when rearranged alphabetically spells out IIMNPRST. So I’m thinking that there is 4 pieces of a puzzle here to be deciphered, which can be translated as the following: “I too am impressed”. FINE, I’ll bite. What misprint? Maybe the figure is not a modified hermit, but Justice, often shown blindfolded with sword and scales. Also note toga, roman numerals, latin go with this theme. There is no obvious sword, but maybe that is a hilt showing on the left tucked into the belt? There are no scales, but if room 9 was supposed to be covered, then the two remaining doors would be like the two sides of a scale. 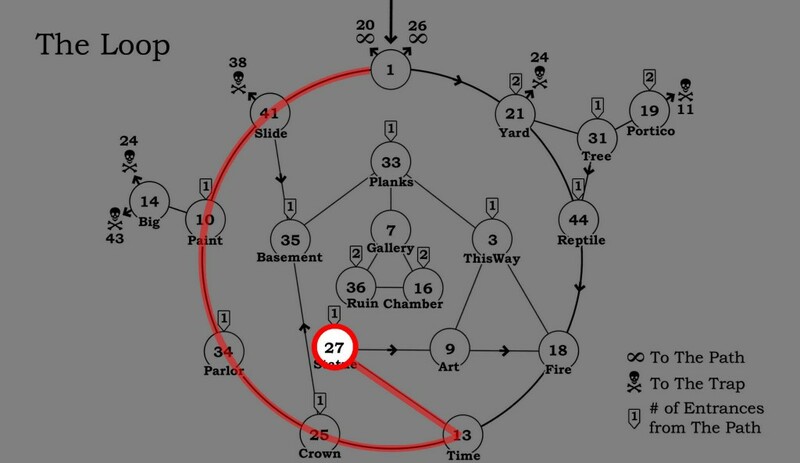 If we match parts of the book, (a technique possibly suggested in 35), the other room with an object resembling a lantern is 22. Here we find the scales. The “13″ sign looks like an open book. This makes you think of the saying “Don’t judge a book by its cover.” That is good advice in here because 13 is an unlucky number, but 13 is the better choice in this room. I find it interesting that the Guide tried to hide the entrance to Room 9. Room 9 does not lead to the Abyss, or to the Trap, or to the Center. All it leads to is a bunch of two-way paths that eventually have to be taken back out to Room 18, which can lead back to this room. Maybe the Guide wants to get the voyage done quickly so that he can lead a new group of guests to their doom? I think the lantern is definitely associated with 13, even though it sits above 9. It’s obviously on the 13 side of the statue, it tilts towards door 13, and the light shines on door 13, while still leaving 9 in darkness. It’s actually ingenious room construction if you think about it, and has to be intentional. Sure, Manson could have hung the lantern directly on the door handle to 13, for instance, but I can imagine him thinking the association was clear enough. Speaking of that door handle – has anyone commented on how unnaturally low it’s positioned on the door? If you trace a line from the lighted, upturned palm of the statue’s right hand, it leads pretty much directly to the door handle of 13. Meanwhile, the prominent “shadow hand” on the left is pointing sort of to the unmarked door to 20, and sort of down. The Hermit is depicted on the inside sleeve of Led Zeppelin IV, and apparently Page himself portrayed the Hermit in concert, and Tarot decks have Pages, and so does Maze, and there’s also a trefoil or two representing other band members soooooooooooo therefore… the guide is a Black Dog? Anyways, I just listened to Stairway to Heaven backwards, and I don’t think it explicitly says Door 13 is the correct one, but it definitely warns against Door 9.
hidden roman numerals in the words. Congratulations also to David Gentile and Vewatkin for other parts of this solution! There are a couple things going on in that quote. WR, in your own words, what do you see as the reason for 9 being the wrong door here? The hermit is blindfolded so don’t choose 9. The tarot symbol is blindfolded. “FATA VIAM INVENIENT?” … nope, don’t choose 9. I’m not sure of the principle that a door being associated with a blindfold means it’s the wrong door to take. But if that principle does hold, then that would be what’s going on here. And what’s more, that would be the case even if Manson wasn’t trying to depict the Hermit. Whether there’s Tarot stuff going on or not, the statue does kind of look blindfolded. You people are too funny sometimes. And what are the odds you think that the statue and lantern would look like the 9 tarot card and be over door 9? Yeah I was a little pissed that WR didnt remember that DG had posted about the numbers but really I was pissed that I didnt notice that the cards had numbers and that somebody out of nowhere snapped it up. But dont take that out on the solution. Its awesome. Personally I am looking forward to being humiliated again next month. WR you never answered Aria question, are you going to reveal the guide??? Did you find an image of The Hermit that looks like the statue in 27? I haven’t been able to find one, but if you have, that certainly merits attention. In regard to factitious, I would challenge him to produce a single example of a blind person in the Maze who is helpful or points the right way. Any example? I thought not. MIT10, you are taking this hobby of ours quite competitively, in what I and many others would consider a collaborative environment, it comes off as a bit disrespectful. You should give kudos to anyone who beats you to the punch rather than feel humiliated that they got it/posted it before you (or whatever the reason is that you feel humiliated, maybe I missed it). I think it’s fair to say that the Tower in 20 fits the iconoclastic look of 99% of Tower cards in tarot decks, in contrast to the not-so-iconolastic “hermit”, who, in almost every card I’ve seen, a beard, and more importantly, no blindfold. This begs the question, would the puzzle in 27 have worked if the statue had a beard and no blindfold. The answer is maybe, because it wouldn’t be the same puzzle. Really the issue I am having is that he doesn’t have a beard. If he were blindfolded and bearded, it would make more sense to conclude that he is the hermit, and that his blindfold shows us that The Hermit’s number (9) is not correct. As it stands, he is too “diluted” by other iconoclasts: one is justice, the most famous statue with a blindfold, the other is the fates, this all makes for quite a confusing mix of characters mashed into one with many possible “subjective” solutions. What I mean by this is the lantern, representing light, could be correlated to the blindfold, which means darkness, why not just say the lantern is closer to the correct door and do away with the whole hermit thing altogether? You know, guys, I’m with MIT10 on this. I think this solution is perfectly fine. I was having some trouble with door 13 being related to cards as well, and playing cards having fortunetelling as one of their possible uses, but I think I’m okay with that since playing cards would more often be used for games of skill and chance. So by choosing 13 you are choosing to live by luck and your own wits instead of by the dictates of fate, I guess. The whole thing about the Hermit not being the Hermit — I feel like there are enough clues there to make you realize he’s the Hermit (evidence: he was long ago identified as the Hermit by multiple people), but then there’s all the anti-Hermit stuff: young and blindfolded instead of old (wise) and looking to the left (the correct direction), missing his staff. He is not holding his lantern as he should be, although his lantern seems to know the way. Also, he’s sinking into the ground, which can’t be good. (Side note: are any of the makeshift-looking doors in Maze correct doors? I think no but will have to check.) All this adds up to make you think of both the Hermit and a kind of “anti-Hermit”: I think Manson is trying to simultaneously evoke the card and the opposite of one of its meanings (wisdom). WR’s got something else in this room, obviously. I wonder if it has something to do with whoever this person is who is acting as the anti-Hermit. So lay off MIT10! (S)he’s my boy! Well, at least we all got a chance to say a lot of stuff. The buying-this-kind-of-thing and not-buying-this-kind-of-thing lines have probably been clearly drawn long before now, and it’s not really necessary to point out with each new solution that if you like this sort of thing then you will find this to be the sort of thing you like, and if you don’t then you won’t. I was obviously being facetious in suggesting that Ben couldn’t name a blind man you’d follow in the Maze, but I was being sincere in asking MIT10 about finding an image of the Hermit that looks like the statue in 27, because her comment seemed to suggest she had, and that would certainly seem relevant to figuring out the room. I am not impressed by the defense that it doesn’t matter whether the statue looks anything like the hermit or not, or that the solution is actually strengthened by how little that looks like the hermit; but I guess that’s just not the kind of thing I like. The onily reason we would justify saying the tower on the couch is related to tarot is because there is another ACTUAL tarot picture on the wall. If the picture wasn’t there, we might more readily associate the tower with a chess piece instead. For all we know, it is both. We have no such confirmation in 27 except the justifications we make around knowing the solution already. That being said, I will reiterate that if one tried, one could find many routes to conclude a correct solution, where Manson possibly intended something SIMILAR but not exactly. A good analogy is trying to fit a puzzle piece into a hole which sort of looks like the correct one, but is not. I have to agree with Vince on this, you either like this type of solution or you don’t. I don’t because the hermit is two factors removed from what hermits on google look like. If you can show me a hermit that looks more like this guy, I will eat my words. MIT10, I did not mean to come off as harsh and I would actually thank you profusely for increasing mazecast traffic via your .edu outbound link. Much appreciated! I (obviously) agree with MIT10′s argument from odds, this is in fact how I came to the conclusion that it was the hermit card being represented here. Aria’s anti-hermit explanation which is far more clear than what I wrote and I think expands this solution in a positive way, thank you! On the other hand I feel for the concerns raised by Factitious, SP and Vewatkin. The difficulty is the myriad of representations of the tarot deck, pre-Google origin of the book, and perhaps the fact that Manson is very well versed in esoteric texts. Who knows what version of the tarot he was looking at? Personally I think the common modern version fits fine but several older versions do not (crutches! wings!) and a few older versions fit better (club! beardless!). The info is pretty incomplete, the hermit is also depicted as a demon, a mason, a witch, and a mystic). So identifying the statue as the hermit card is problematic because of the hermit card itself, my rationale for taking it as such is that the lantern and robe looks spot on to some modern and ancient versions, the room is about cards, the number 9 matches, the Roman numerals match, and the question “FATA VIAM INVENIENT?” makes great sense, and the differences between the statue and the hermit card can be reasonably interpreted. MIT10 perhaps the phrase “You people are too funny sometimes” was a bit too…something. Like SP said, this is a collaboration. Debating stuff is what we do best and critiques are always welcome! Every pic in that link you posted of a hermit has a beard, he looks nothing like The Fool, and there is literally nothing about fate in the description. The lantern is the only element 27 and The Hermit have in common. I can’t tell if you are ignoring my statements about iconoclasm losing its meaning if it’s deviated from too much, or trying to convince us that it doesn’t matter because there are other elements that cancel that out. Using the same method of variations, one might argue that there is more reference to fate and cards (chance, etc.) than there is to an actual hermit. The fates are 3, but there is 1 statue. 1 + 3. Reverse engineering to narrow down the symbology to numerology. I am doing the exact same thing you are doing (identifying something and giving way to varation) in order to come to a conclusion. In the chat room, Vince mentioned that there are a multitude of characters who are blind in Greco-Roman mythology, for the purpose of finding the truth, or the way, completely out of the scope of Tarot at all. Off the top of my head, Jason used blindness (in a sense) to his advantage to defeat Medusa. Theseus used the ball of twine in the dark to find his way back. Oedopus was told not to look at his bae or she would go back to Hades, etc, justice is blind, etc. Lots of symbology here about blindness and truth being linked. So to this end there is just as much justification to trust the blindness as to turn away from it. When i say iconolast i mean iconic. I am such a hoi poloi. Please forgive my broken English, I hope it doesn’t ruin my credibility like room 17 did! haha! But seriously..there’s a LOT behind blind truth metaphors. Hilariously, Beelz gives the blindfolded hermit solution in the MazeCast episode about Room 27. You would think that’s what the MazeCast people here would have been noting, instead of just trashing the solution, but apparently even we didn’t watch that episode. Remarkably, it seemed barely a minor concern that the statue looked nothing like the Hermit. Here’s another ant-Hermit thing. The Hermit is usually depicted on top of a mountain, symbolizing solitude, pinnacle of wisdom, etc, whereas this guy is sinking into the ground, and door 9 is nearly buried. Well, this stirred up a lot more thought than I initially expected! Back in 2014–WHAT, is that right? Back in 2014, when we did our eternally memorable MazeCast that discussed this solution, there was a push to find a lot of tarot-related things in MAZE, which bore some fruit but in some troubling ways. We eventually forgot all about it, but it’s all coming back now. I’ve compared it to the alphanumeric coding that seems to pop up everywhere–it’s hard to imagine that Manson intended all of it, or none of it, and it’s hard to imagine how he could have intended some of it and not noticed the rest of it. It’s also hard to get a baseline for how often something like the alphanumeric solutions or the tarot connections might happen by accident. I glanced at the major arcana and jotted down some things that appear in both tarot and MAZE (sun, moon, stars, towers, devils, skeletons, horns, human figures, wands, swords, water vessels, sphinxes, kings, angels, trees, lightning, columns, funny hats, scrolls, candles, hourglasses, pentagrams, figure eights, flowers, laurels, tables, thrones, keys, snakes, Garden of Eden imagery, chariots, scales, upside-down people, horses, chains, clouds, birds, lanterns, numbers), and in simply asking what the chances are that some object associated with a tarot card would appear in conjunction with a number related to that same tarot card without relevance, I don’t think we should treat that as a rhetorical question with an implied answer of “a billion to one against.” It actually seems pretty likely that it would happen even unintentionally, given that all the tarot numbers are in the Maze and the Maze is full of objects that overlap with the tarot; but that doesn’t mean much, because we also need to consider WHY the Maze is full of objects that overlap with the tarot. I’m not sure that pretending that we’re considering the odds is actually ever helpful, and David Gentile probably provides the best cautionary tales in that regard. Any specific accumulation of details is unlikely to have occurred by chance even if they bear no apparent significance. What are the odds that a bowling pin and an umbrella and a sign that says “SiGN” and the letter S and a six-legged table would all happen to be in the same room BY COINCIDENCE? A priori, extremely low, but that’s obviously not a useful question. And whether we consider “what are the odds that the number 9 and a lantern would occur together?” to be a useful question essentially circles around to how meaningful we think this connection is, which is deeply related to how intentional it seems, which is nominally what we’re trying to determine by inquiring about the odds in the first place. All of which is to say, I don’t think it’s shameful to rely on your intuition about what the author might have intended, because everyone is almost certainly using the same kind of intuition in their calculus at some point. You might be wrong, dreadfully wrong, perpetually wrong–but the disconnect between your intuition and reality is not going to be cured by phrasing your arguments in terms of probability. I think it’s fair to say, given the amount of time that has been spent looking for any Hermit that matches this statue and the tremendous research advantages 2016 has over 1985, that if Manson based the statue in 27 on some version of the Hermit that we haven’t seen then it was from a source so obscure that he couldn’t have have intended for anyone to know what he was referencing. But the thing is, that doesn’t even look like a hermit at all, even apart from not looking like THE Hermit. The best excuse for this that we’ve seen so far is that this is actually a sort of anti-Hermit–young, instead of old, blindfolded instead of wise (? ), standing close to a lantern instead of holding it, not having a staff instead of having a staff. And that seems to work ok with the interpretation everyone is laying on it–but it seems fairly problematic to me that a solution that relies on elements invoking the Hermit also seamlessly incorporates the lack of salient aspects (or presence of contrary aspects) of the Hermit. Realistically, what would defeat our confidence in this solution, if it’s strengthened both by similarities and dissimilarities to the Hermit? But man…lantern, 9, coming from 20 with The Tower…it’s pretty enticing. It also seems problematic, as noted above, that none of the Hermit stuff is even necessary if the end step of the solution is to say that the figure is blindfolded and is therefore a metaphor for being lost or whatever, and that therefore we shouldn’t take the door associated with the figure. The same basic solution has been advanced for the blind mouse in Room 9, and if we accept that that’s how things work, it doesn’t matter how social this blind man is. It also seems likely that if Room 9 were the correct answer here we would be focusing on the lantern as a symbol of light and clarity, suggesting that the statue represents a lost and blind person attaining sight and direction, or something of the sort. However you’d want to phrase it, we have a blindfolded person and an actual light source both prominently associated with the doorway here. Think of Room 9, where the mere image of a light source is suggested to indicate the correct door in contrast to the blind mouse on the other side of the room, and I don’t think it’s hard to see that where a blind person and a light source are associated with the same door the interpretation could have gone either way in terms of which one matters. But if we assume there is taroty stuff going on here, that’s where the conversation gets interesting, because connected to this room with have Room 13. Death is the 13th tarot card, typically depicted as a skeleton, and Room does in fact include a couple skeletons. Room 13 also has an unmistakable theme of time and timepieces, which is also related to the mythical character of Death. This is especially true of hourglasses, though hourglasses are not a traditional element of the Death tarot card. So, is that a coincidence? Did Manson unwittingly put skeletons in the Death-numbered room connected to Hermit room connected to the Tower room? Does that mean anything? Well, it does if you want it to, sure. Death is bad, it’s on the clock, clock shows 18:00, don’t go to 18, right? Good enough. If 25 were also wrong we’d say both 18 and 25 are marked by the Death figures on either side of the clock, but 25 is the correct door so we’re not going to say that. Let’s say we go the other way, Room 9. Room 9 includes that little corner of a painting showing what seems to be the sun shining on a palatial edifice of some sort. But in the tarot, it’s The Moon that this image most resembles; the Moon is drawn with a rounded shape and emanating rays, and it shines down on towers or castles. And what number is The Moon? 18. And this image is right by the door to Room 18. WELL I made myself sick with that last one, but I guess you get the point. There are a lot of places where you can not only find images/objects similar to tarot cards, but where numbers in the Maze can be argued to relate to numbers of tarot cards. What’s difficult for me is that I don’t see a figure (that is not the Hermit) standing by a lantern and the number 9 as a stronger connection than the skeleton in Room 13 or the chariot/sphinx combination in Rooms 33 and 3; if I could be persuaded that the latter two happened by accident, I would conclude perforce that the lantern and 9 could happen by accident. But If I accept that all of these connected observations were implanted deliberately, it makes it harder to believe that others slipped through accidentally. And then we encounter peripheral cases where the connection is weak or silly and readily dismissed, unless we believe we have some special excuse to go looking for tarot card references, which we seem to have after Manson has done it half a dozen times. I’m legitimately unsure about what the correct conclusion is to draw about these tarot connections. Not just the ultimate interpretation of them, but the question of whether we ought to accept them as real or not. The Tower is unmistakable, but after that, confidence drops off dramatically. There’s so much stuff on Tarot cards that’s also in MAZE that it is in fact possible for one particular one to happen by chance, without Manson intending it. [I'd personally add that the Tarot is meant to be full of symbols you can connect to anything; that's kind of the point of the Tarot.] Asking about the odds of some specific arrangement arising by chance doesn’t contribute anything. We haven’t been able to find a Hermit card that looks like this statue, despite spending lots of time on it with access to online research, so Manson didn’t base the statue on the Hermit in a way he could have expected anyone to recognize. The statue also doesn’t look like a hermit, let alone the Hermit. Citing differences between the statue and the Hermit as support is problematic. If a theory is strengthened both by similarities and by differences, it’s a theory made to be immune to evidence. If the end step of the Hermit theory is that the statue is blindfolded, so we shouldn’t take that door, then none of the intermediate Hermit stuff is even necessary. This step has problems of its own: it’s inconsistent with how images of blindness and light are interpreted elsewhere, and the whole thing is full of motivated reasoning. It’s doubtful that Manson intended blindness and light sources to be self-sufficient symbols of avoidance and guidance. There are plenty of other rooms with images vaguely suggestive of the Tarot, at least on the level of this one if not stronger. [Many examples are given, the enumeration of which is outside the scope of this summary.] How intentional are they? Should we accept them all as real, even the ones that we’d dismiss as silly if there weren’t already other Tarot theories causing us to go looking for more? Ben’s summary is accurate, and probably captures my tone accurately, but not the tone I imagined or intended. I would add, only for purposes of clarification, that my main point here is not to criticize the solution; my point is that there are a lot of interesting possibilities that follow from accepting some ambiguous tarot connections, and there are more than a couple compelling coincidences suggesting intentionality; but that the scope of potential tarot references, the overlap between tarot imagery and MAZE imagery, and the plausibility of using tarot symbols to indicate whatever you wish, make it difficult to pick a logical ending point with reading the tarot into MAZE. To augment my clarification: I was hoping to inspire further discussion of tarot references in MAZE, not discourage it. It’s worth noting that I am critical of the solution, which probably affected the tone of my summary of your post. I should clarify, though, that I’m glad this Hermit stuff was proposed and is being discussed. Solving MAZE is going to require us to raise a lot of potential solutions, and it’s expected that in the course of that, there will be some (let’s be honest, lots) that I don’t think work out. SP, the 3rd and 4th images are beardless versions of the hermit card. I don’t have a better version of the 4th image but if you look closely you can see that the face is pointed backward and under the chin is a shadow which matches the opposite shoulder. He is holding a club and has a lantern hanging from his belt. In the 3rd image the hermit is resting his chin on his hands and his hands on a staff, I have a better version of this image if you need it. Factitious, Vewatkin, Thanks for the summaries. What a great discussion! In my opinion the chief difficulty with any solution such as this is that the book was made by a single person 30+ years ago. The Manson I know today is not the same Manson who made the book – so we are really asking, “what would 1980s Manson have done?” and what he would and would not have deemed a reasonable puzzle is at times nigh impossible to divine. We take “sea bag O.K.” to be “Go back” not because it is the one and only possible solution which will ever present itself but because we have concluded that it is highly likely that “Go back” is the solution. We are always playing the odds. Interesting that card 20 is Judgement… “Awakening of discernment, and record of your soul’s journey.”… You have reached the end, it’s time to check your scorecard. Interesting too that the door from 37 to 20 has the “Pair o’ dice” leading to the “rope ladder to Heaven.” Well, okay, that’s probably a stretch. And of course, card 21 (20 + exiting through 1) is The World. Which is the solution. Hello Gregor said a bunch of stuff way down below about free will vs fate, which I thought was pretty good. There’s also clearly some kind of Oedipus thing happening, and it seems like these two ideas should go together. Irene did some good stuff with this but ended up with 9 as the correct door. Oedipus’s parents attempt to cheat fate by ordering their child killed, but he’s spared by the shepherd who was supposed to leave him for dead. Oedipus hears about the prophecy and flees the people he thought were his parents, but ends up enacting the prophecy as a result. I’m not totally sure about this but it seems like the play’s message in the end is that fate will win out. Door 13 = DEATH card in the Tarot, and also the ace of spades is known as the death card in legend and folklore (according to Wikipedia, anyway). There’s a lot of death in Oedipus Rex… he kills his father (by STRIKING him dead with a staff, hence another use for the bat, and another connection to the hermit, who carries a staff), and his wife/mother kills herself by hanging. So maybe the connection is just that the play features a lot of death. BUT, maybe more convincing, at the end of the play we get the chorus saying stuff about how great Oedipus was but now he has fallen and only DEATH can bring peace: “So while we wait to see that final day, we cannot call a mortal being happy before he’s passed beyond life free from pain.” So take the death door. Back to the fate/free will thing, there is all the luck/superstition stuff associated with 13, which Hello Gregor has already listed (unlucky number 13, cards, black cat), and which supports 13 as the door associated with fate. HG also talked about 9 being the door associated with free will, since there was intention and work involved in uncovering the door and attempting to undermine the intentions of the Guide. If Oedipus Rex’s underlying message is that fate wins out, then the answer to the statue’s question is door 13 = yes, let the fates decide. Man, sorry this is so long. Hope there’s some kernel of something in there. This comes to pass, and part of the deal is that only Theseus (Theseus!) and his heirs can know where Oedipus is buried in order to keep the blessing intact. So we have a death being a blessing (take door 13), and a secret burial ground that must remain hidden. Something that someone might be upset about if it were uncovered?!? Don’t take door 9, because you will be disturbing Oedipus’s burial place, and the blessing will be lifted. One more thing… another death-related item for door 13 is that the column toppers look a lot like cremation urns. Waaaaay down below Dave Gentile pointed out that this room evokes the tarot trump 9: The Hermit, mostly because of the lantern and the raised lone figure (who we now know is Oedipus, but that’s probably part of something else). WR said, “Correct on the hermit and the card number but not the meaning.” So hmmmm. In most versions of this card (including the one from the Rider-Waite deck, probably the best known), he is shown in profile looking to the left, with his lantern aloft and lighting the way to the left. In this room also the lantern is on the left side and illuminates the door to 13 over on the left. So take the left-hand door. Sorry if I’m repeating anything without proper credit. A few more hermit thoughts. The lantern on the hermit card is often shown to contain a glowing six-pointed star, which according to some sources is a Seal of Solomon and therefore associated with wisdom (“Solomon the wise”). So the light of the lantern represents wisdom and truth, and we should take the door illuminated by the lantern. More generally the card is about seeking and finding wisdom and truth. Another reason to follow the hermit and the light of his lantern. More tarot stuff. In a reading, the death card is not necessarily bad. In fact, it often means difficult but positively transformative change. I’m not saying Manson read this book, but just that others have seen a connection and progression from the Hermit to Death. The lamp has four sections. Four can be split up like 1 and 3. Also There are 169 bricks, the room is square, the square 169 is 13! Could the 9 be an upside down 6? Six also being an underground room, it would help hide the entrance to flip the sign. Also in 6, there is an eye. Maybe one of fate’s missing eyes? Your log in has been confirmed and you may now post freely. Manson (the author) has confirmed that all the door numbers are as they appear and only the door to 17 is hidden. 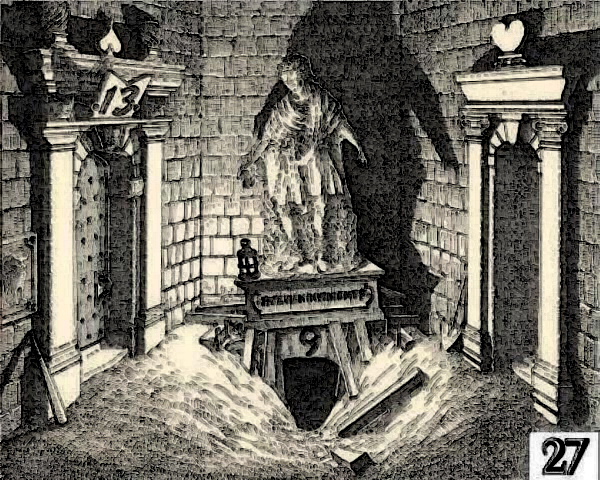 The wood in front of the statue reads “FATA VIAM INVENIENT?”, which means “Will the fates find their way?” The words (above the passage to room 9) suggest that the passageway to room 9 is questionable, so the door to room 13 must be the answer. So, the door to room 13 has all 52 cards! I was worried about you all day, thought you wanted to eat a cat! I’m OK now that White Raven clarified you…lol. Great video. Silly rabbit, ketchup goes on dogs, not cats! Wait, what? Cats are delicious, how did you know? Fate can find a way? No. But at burger king you can have it your own way. The guy in that commercial uses “Coca Cola” as a plural! Incredible! How times have changed.